The world of post and beam is one where homes are snug, warm and draught free. Where low energy running costs are matched by precise engineering quality and a new home doesn’t need to come at the expense of future generations. “Post and Beam” construction or “Timber Framing” is a general term for building with heavy timbers rather than “dimension lumber” such as 2″x6″s or concrete such as insulated concrete forms. Early settlers introduced the concept of post and beam construction in North America although the system dates from the earliest buildings of Greece. The earliest surviving examples from Europe include houses, barns, cathedrals, and abbeys from the twelfth century. These structures were built by highly skilled and trained guild carpenters. In modern building, the posts and beams are usually spaced well apart; more than 600 millimetres by definition, but usually 1200 millimetres or more. The National Building Code of Canada requires engineering design of all structural members spaced more than 600 mm apart. Wood decking is often used for the floors and roofs, spanning between beams. Conventional wood‐frame construction, however, can also be used between the posts and beams, with studs, joists and rafters supporting the sheathing and sub floor. In fact, post and beam construction is sometimes combined with conventional wood‐frame construction or SIP construction (Structural Insulated Panel). Fast erection is another feature of post and beam homes construction. Since there are few members and joints, the framework is simple to precut and assemble. Infill panels can be fabricated in the shop and inserted quickly into the structure. 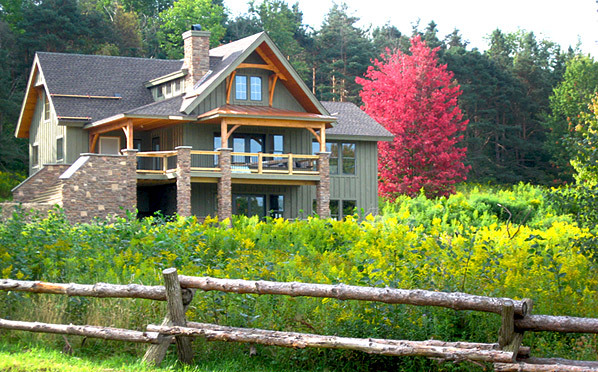 In addition to custom homes, many agricultural buildings are built using pole construction, in the post and beam style. Lengths of lumber available will depend on species and location. Lumber in western Canada is readily available in lengths up to 6.10 metres; in eastern Canada, in lengths up to 4.88 metres. Longer lengths can be obtained on special order, but unit costs may increase. For smaller sizes, any species of lumber can be chosen, but for larger sizes it may be necessary to select a western species, such as Douglas Fir, Western Larch or Pacific Coast Hemlock. Trees from the west grow bigger and taller than those in the rest of Canada. They yield larger sizes of lumber but are sold across Canada. Roofs and floors can be built using exposed decking or conventional sheathed joist and rafter construction with a finished ceiling. The exposed decking, however, lends itself best to post and beam construction since it is so attractive. If finish flooring is applied over decking, it should be laid at right angles to the decking, using the same procedure as for conventional construction. If heavy concentrated loads occur, additional framing may be needed beneath the planks to help carry the loads to the beams. Load‐bearing partitions, if they occur, should be placed over the beams, and the beams should be designed to carry the loads. Or supplementary beams can be put in the floor framing arrangement. Usually, however, partitions are non‐load‐bearing in post and beam construction. If they are set at right angles to the decking, no supplementary framing is needed for non‐load‐bearing partitions if calculations show that the decking will support the dead load of the partition. Allowance must be made for movement around the perimeter of the panels, such as beams deflecting at top and bottom of the panel. Frames should be designed to take care of this change, particularly where there is glass so that no damage will occur. Joints should be airtight to seal the frame. The higher R value can also be achieved by adding rigid insulation to the outside of the studs or posts or by using furring or strapping on the studs or posts and adding additional insulation in the cavity. A rough estimate of a finished home averages somewhere between $200 and $300 per square foot, not including land or land improvements (power, well, septic, driveway, etc.). The cost of a timber frame can be slightly higher due to the custom hand craftsmanship involved. However, if you compare the attributes of timber frames’ naturally open floor plan and the ease of creating a cathedral space to the premium expense of having these in a conventionally built structure, then the cost is very comparable. 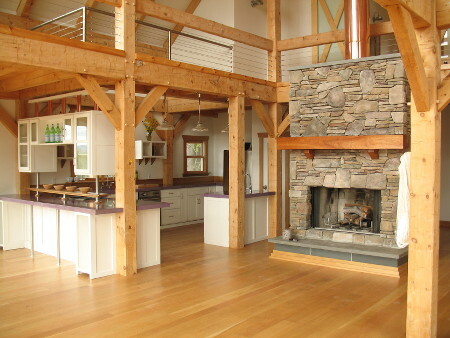 Conversion of Post and Beam Barn into a comfortable home – courtesy of Vermont Timber Works INC.
Also, the cost of building your new timber frame home depends on choices you make: materials, architectural details, design complexity and selected Homebuilder or General Contractor. Site conditions and location are also important cost factors. Yes, you will use less energy to heat and cool your home, which reduces your monthly bills and decreases the home’s environmental impact. Most designs can be Energy Star and LEED certified. Timber frames homes are built with sustainable practices and remain among the most environmentally-friendly houses available. 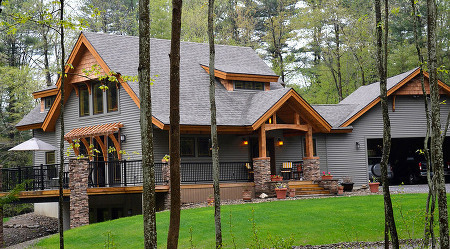 A timber frame home requires little maintenance. Most of the builders use passive design techniques to take advantage of the natural climate to maintain thermal comfort, so the home can be affordably heated and cooled. How is the structure insulated? One of the great benefits of building a timber frame is using SIPs (Structural Insulated Panels) to enclose the structure. Efficient R-values can range from continuous R-16 to R-65. SIPs can be used for your roof, walls and floors. Typically, they are Eastern White Pine, Douglas Fir or Eastern Hemlock. Other species of wood may be used as well. Our wood proudly comes from multigenerational family mills. Depending on your bioregion there is typically a variety of suitable species. Care has to be taken in the processing of the wood from tree to Timber Frame. The function of timber, joinery utilized, and aesthetics are all taken into consideration. Many Traditional Timber Frames used a variety of species in a single home. As a craft tradition, Timber Framing has used green wood since its inception. Throughout the ages, carpenters refined a system of joinery to work with “live” wood. Millions of Timber Frame structures from the Twelfth century onward have been joined in green wood and are still in active use today. In addition to “green” timber Kiln Dried and reclaimed offer a more consistently stable option where desired or necessary.